We all love happy hour but what most of us don’t like are the flies that can often come with it. Trying to relax at your favorite time of day with a drink or nibbles can be ruined by constant annoyance by flies buzzing around landing on your food or in your drink. Even just trying to have lunch or dinner can be annoying with them buzzing around your food. A few weeks ago however we discovered the ShooAway and had to try it out. This little gadget is amazing! Simple and easy to use, our fly shooing has reduced dramatically since we got it. 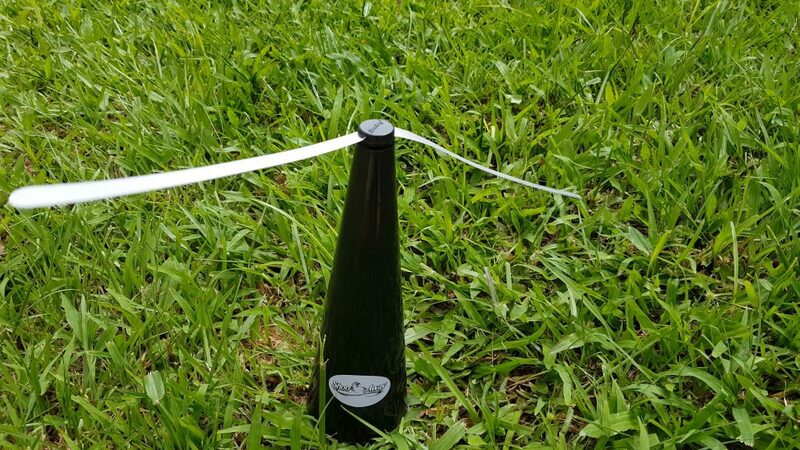 The ShooAway has two gently moving soft stop blades that spin around distracting flies and preventing them landing on your food. The secret is in the blades which have a dual purpose. They are soft flexible blades and turn gently, simulating a waving hand that shoes the flies away for you. Also, at t the end of each blade there are a series of holographmatic discs. (Yes, I know, I found it hard to say also) In simple terms a collection tiny shiny mirror like dots that reflect the light as the arms spin and repel the flies. The unit is powered by a noise free motor that stops if something gets in the way of the blades, like your hand reaching for some food. Being soft and flexible the blades will not hurt if they come into contact with you which makes them ideal around children, or pets for that matter as you can see from Banjo in the image below. Not sure if it is the cool breeze or lack of flies, but he looks happy. Each unit is powered by two AA batteries and being only a small motor, they last for ages. 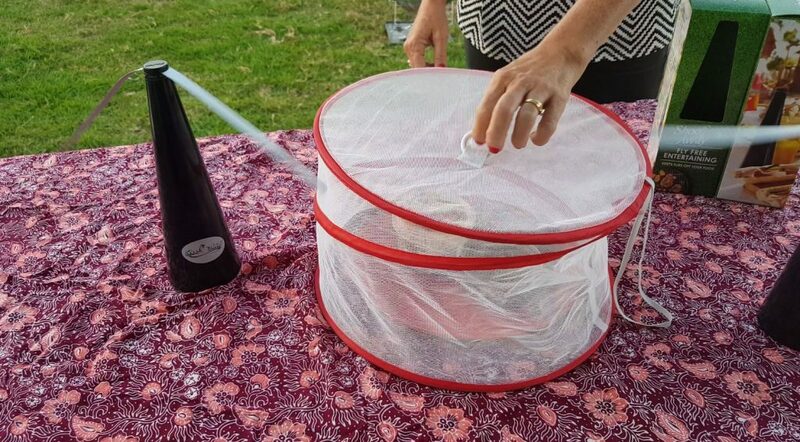 Another great advantage of the ShooAway is that you don’t have to use fly spray or repellents, especially around your food, making it the perfect chemical free solution to getting rid of flies. Of course you can use ShooAway in so many situations around the home for any food prepping or BBQ area, but we find it particular useful camping because we are outside so often. 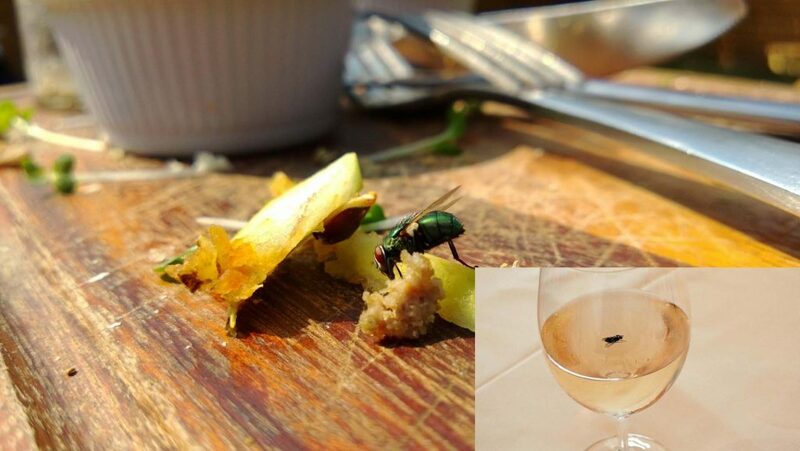 Each ShooAway is high enough that it will clear most wine glasses, but effectively keep flies away from plates of food also. A single unit will successfully cover an area of about one to one and half meters, so depending on the size of your table or the area you need to cover you may need two units. You can see the ShooAway being used in the video below. We tried our ShooAway in a few different locations and were quite impressed. Whilst they will not stop each and every fly, they certainly reduced the amount that were hanging around. Our best test was one of our sessions where we had lots of Cheese and Salami which can be major fly attractants. We kept moving the ShooAway around the table and found that as soon as we did the flies would return, but located near the food, it was a definite deterrent. They were definitely better than the food nets we have used in the past as we didn’t have to keep moving them to get to the food and then forget to replace them.